The cherry blossoms: D.C.'s most dazzling rite of spring. From navigating crowded sidewalks to maxing out your camera's memory card, there's nothing like spring in the District. 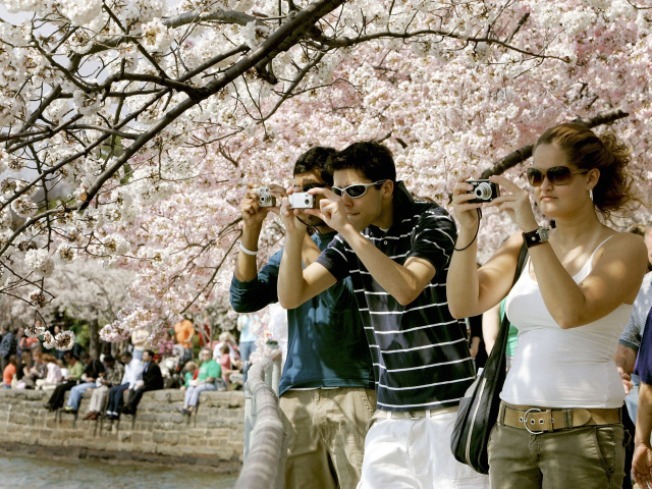 This year's fantastic array of related events kick off this Saturday and run through April 11 in the form of the National Cherry Blossom Festival. The forecasted peak bloom dates are April 1 to 4, according to the National Park Service's latest prediction today. They moved up the dates due to last weekend's gorgeous warm weather. The overall blooming period is expected to be from March 28 to April 9. This year's parade will be on Saturday, April 10 at 10 a.m. The parade route runs along Constitution Avenue from 7th to 17th streets N.W. Giant balloons, marching bands and an assortment of performers will energize the city. The National Cherry Blossom Festival kicked off Saturday with visitors viewing the blossoms and related activities. Family Fun Zone near the Thomas Jefferson Memorial -- Saturday and Sundays, March 27-28, April 3-4 and April 10-11, 10 a.m.-5 p.m.
Cherry Blossom Soccer Tournament at JFK Hockey and Soccer Fields -- Saturday and Sunday, March 27-28, 8 a.m.-6 p.m.
National Cherry Blossom Festival Family Day at the National Building Museum (401 F St. N.W.) -- Saturday, March 27, 10 a.m.-3:30 p.m.
Samurai Orchards and Other Japanese Orchid Treasures at the U.S. Botanic Garden (100 Maryland Ave. S.W.) -- Wednesday, March 31, 6:30-8 p.m.
Southwest Waterfront Musical Prelude to the Fireworks (600 Water St. S.W.) -- Saturday, April 3, 5-8:30 p.m.
National Cherry Blossom Festival Fireworks Show (7th Street and Maine Avenue S.W.) -- Saturday, April 3, 8:30-9 p.m.
Lantern Lighting Ceremony at the Tidal Basin (Independence Avenue and 17th Street S.W.) -- Sunday, April 4, 2:30-4 p.m. The Cherry Blossom Festival Parade (Constitution Avenue between 9th and 15th Streets N.W. ); parade free; grandstand seating ticket info here -- Saturday, April 10, 10 a.m.
See the complete list of events here. Feel like a (short) trip? Some of the events spill out into Maryland and Virginia.